Are you required to stand for long periods of time at your workplace? Why not have an anti-fatigue mat to help prevent your leg muscles from becoming static and constricted? They provide a cushioned surface and relieve back and leg stress. Order in the month of April and receive a Tim Horton’s gift card. Some terms and conditions apply. Swan Dust Control Ltd. is a family-owned Canadian business in operation for over 70 years, and has offered mat and mop rental in South-Western Ontario for over 40 years. Swan’s head office is in Waterloo with another facility in London, and now, Brampton! Swan is dedicated to a cleaner environment. Swan is dedicated to using environmentally-friendly processes to clean and treat our products. Our reusable mats and mops reduce unnecessary waste, our anti-pollution technologies keep the dirt and grime out of the water supply, and our waterless mops and treatment system conserve our precious resources. 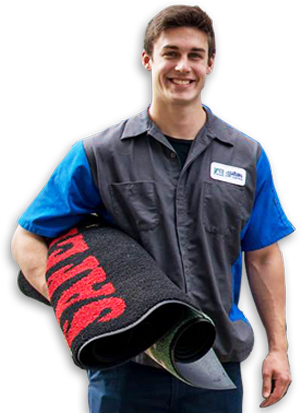 Wednesday Apr 24, 2019 | What's So Great About Swan's Mat Rental Service? Let Swan Do The Work! Wednesday Mar 20, 2019 | It's Spring Cleaning Time! How Will You Get Your Business Ready For Spring? Do You Have Safety Precautions In Place This Winter? A Nice Smell In The Air Goes A Long Way! How Can I Get Customers to Return For A Second Visit?